Nick takes his Sweet Heart for a spin in T-33! Cal Kennedy drifting T-33 at the 1953 Hot Rod Hill Climb. Amy throws the Flag for Janice Sayles! The Bell Plumbing roadster leaving the line. Doug Cimino in the Ardun powered deuce coupe. 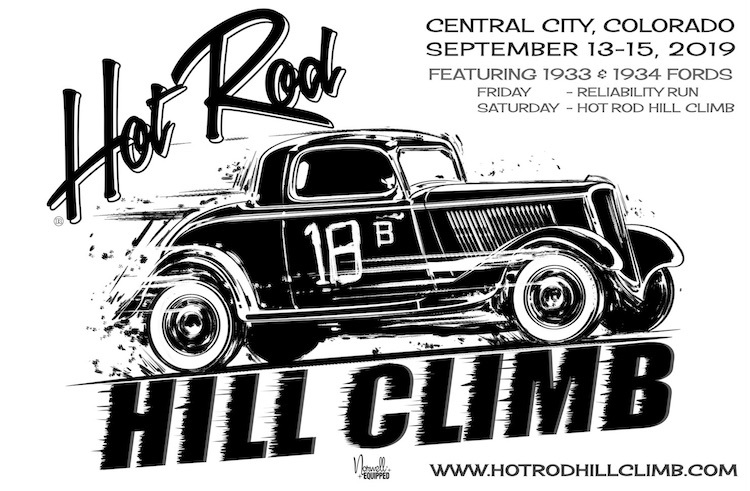 Hot Rod Hill Climb is a throwback to the 1950’s where Hill Climbs were sprouting up all over the United States. In-fact Colorado’s own Georgetown was host to the Hot Rod Hill Climb in 1953, 1954, then Nick’s Hot Rod Garage brought back two 60th anniversary events in 2013 and 2014, and a third in 2015. Central City, Colorado was helped us reach new heights in 2016, 2017 & 2018 and we are back for 2019. This new location allows our Hill Climbers more runs, more rooms, and more FUN! Join us this year!